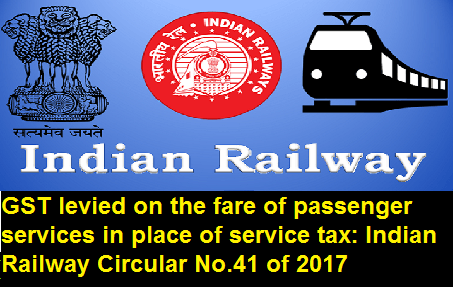 New Delhi: Indian Railway MINISTRY OF RAILWAYS, issued Commercial Circular No.41 of 2017 to implement Goods & Services Tax (GST) on transportation of passenger. This office letter No.TC-II/2910/2017/GST/2 dated 09.06.2017 containing detailed approach paper for implementation of Goods & services Tax (GST). (vii) All other type of first class and AC class coaches if any. 2. The rate of GST shall be 5% on total fares as per the logic of application, GST vide Appendix- A. 3. As regards to Duty pass, Privilege pass, any other complimentary passes which are not reimbursed to Railways etc. and where no money transaction is involved, GST shall not be levied. 4. On Concessional tickets/Privilege ticket orders (PTOs) tickets etc., GST shall be levied at the prescribed rate on total actual fare collected after concession/rebate. 5. The GST amount shall not be rounded of. In case of showing separate GST amount for CGST and SGST/UTGST in that case also GST amount shall be separately mentioned upto two decimal place . As regards rounding off of chargeable fare, after levy of GST on the total fare charged including Superfast surcharge, reservation fee, etc as applicable therefore it shall be rounded off as per approved principles. (i) In case of combined return journey tickets, separate tickets for onward journey and return journey tickets may be issued in all cases whether for UTS tickets or for PRS tickets. However for suburban UTS tickets for which journey originating/terminating station is within the same state/same UTS issue of combined return journey ticket over suburban section shall continue. (ii) Circular journey tickets shall be discontinued w.e.f 01.07.2017. (iii) Issue of AC Class tickets from UTS counter shall be discontinued w.e.f. 01.07.2017. (iv) Issue of cluster tickets from PRS shall be discontinued w.e.f.01,07.2017. However, issue of cluster ticket in UTS shall continue. 7. In case tickets were booked in advance alongwith service tax for journeys to commence on or after date of implementation of GST, the Goods & services Tax difference of fare shall not be collected on the tickets booked in advance. This shall be applicable on tickets issued on or after 01.07.2017. 8. In case of Mobile tickets, location of supplier shall be originating station and mobile tickets shall be issued only to unregistered users. 9. Commercial inspectors and TIAs should visit all important stations and ensure that GST are levied on tickets issued as per the GST rules. Commercial officers should also make surprise checks at the stations and ensure that GST are levied from date of implementation of GST. 10. All other terms and conditions shall be followed as per approach paper for implementation of Goods & services Tax (GST) mentioned above. 11. This issues in consultation with Rates Dtte., Accounts Directorate and Finance (commercial) Directorates. 12. The date of implementation of GST shall be W.E.F. 01.07.2017. Zonal Railways may take suitable action accordingly. 13. CRIS shall ensure necessary changes in the software. 14. Necessary instructions may be issued to all concerned. 15. Wide publicity should be given through different media. Goods & Services Tax (GST) Implementation on transportation of passenger by rail: Indian Railway Circular No.41 of 2017 1. Goods and service tax (GST) will be levied on the fare of passenger services in place of service tax (including cess) on the following classes.